Our product range includes a wide range of movable cabin, steel guard cabin and guard cabin. We are one of the leading designers, traders, and suppliers of Movable Cabin. This is made of pre-coated sheets insulated with EPS. Our Movable cabins have a toughness of steel, light weight and strong heat and sound insulation. Wall of this cabin is made of finished EPS sandwich panel of 100 mm. With thorough understanding of the relevant industry, we are offering a wide range of Steel Guard Cabin. Offered guard cabin is constructed by our skilled professionals using the best quality steel and innovative technology in adherence with industry norms. The provided guard cabin is used ideal for the use as security cabin, gatehouse cabin, ticket kiosk and other such places. 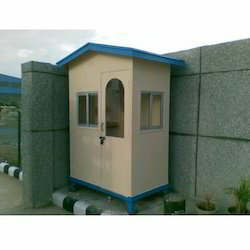 Moreover, we offer this guard cabin in different sizes at nominal prices. 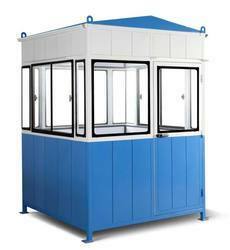 We are engaged in designing, supplying and trading of Guard Cabin, which is made of color bond/ steel. This steel cabin has a sleek design with MV-300 wind driven body. Our guard cabins are known for features like weather resistant, aesthetic design, zero maintenance costs and multiple colors. This cabin consists of wind driven roof ventilator and frame coated with galvanized paint.